Recently, one of my favorite retailers, Erie Drive, asked me to be a contributing bloggger for their blog, "The Niche". I said YES! Today they did an introduction post about me. More posts written by me are coming soon. Erie Drive carries beautiful products. I am partial to the bkr glass water bottles. I keep one on the first floor of my house near my computer and a second one upstairs in my quilting room! 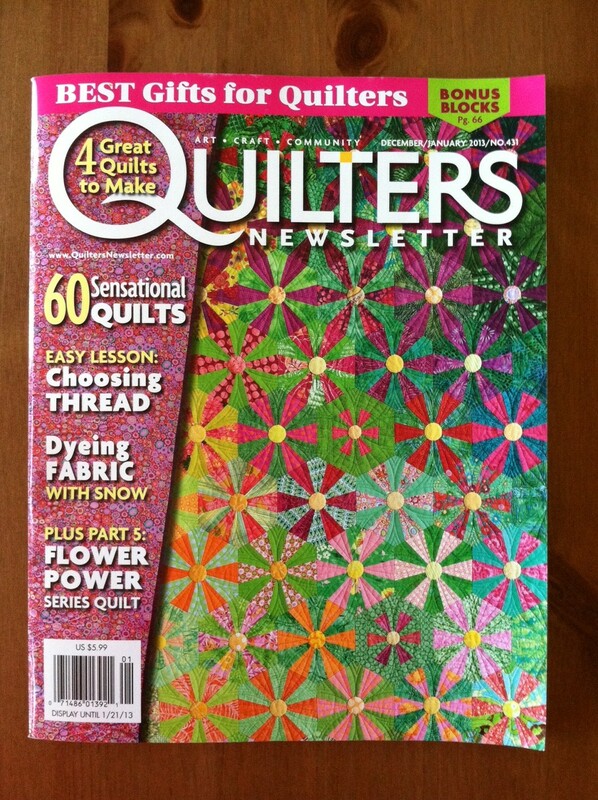 If you asked me ten years ago what my quilting goal was, I would have told you that it was to have a quilt on the cover of Quilters Newsletter Magazine. That really was as big as I could dream at the time. (Actually, I probably wouldn't have told you. Telling you would have jinxed it. But I thought it.) Ten-ish years later, Catena is on the cover of the Dec 2012/Jan 2013 issue! To have a goal and see it realized is fantastic. My dad told me I needed another goal, and gave me a great idea for a new one. But I won't talk about it. It might jinx it. My subscription copy still has not arrived in the mail, but my friend Linda found a copy in a quilt shop in Maine. Everyone around me is glad that I can see the final results. I quit stalking my mailman and the staff at the local bookstores. And my kid is very happy not to take *another* ride to the bookstore. Inside is an article about me and the quilt, as well as the block pattern. There is also an article written by the fabulous Madeleine Roberg, one of the women behind The Printed Bolt. The magazine is officially on newsstands November 20.